©2005 Douglas Borton (P)2012 Audible, Inc.
Would you consider the audio edition of Dangerous Games to be better than the print version? That's a really tough question to answer. I love reading and listening, both for different reasons. But I must say this version of Mr. Prescott's book was beautifully produced. The voices were wonderful and the technical aspects perfect. I loved the relationship between Tess and Abby. The tension and dialog were spot on. Of course as always the suspense and thrill rides of a Prescott novel were ever present, but I have come to expect and enjoy these elements as a given! Have you listened to any of Suehyla El Attar’s other performances before? How does this one compare? I haven't listened to her other books but may well check them out. She was excellent! Definitely. Wish I could have but I had to be satisfied with my morning walk (over an hour each day) and my daily commute to work (another hour). 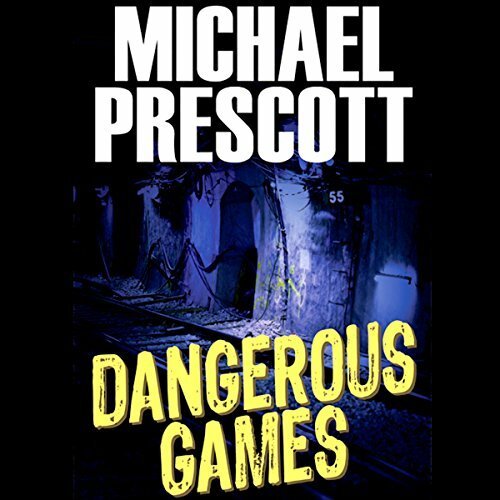 Mr. Prescott is a consummate professional - a fantastic writer with a great track record. I'm now listening to Grave of Angels, his newest. Fantastic! I really wanted to love this book. Two strong female protagonists chasing a serial killer... What's not to love? But the two main characters were more antagonists than collaborators. Each were so prickly, suspicious and withholding that I spent large parts of the book shouting at them to SHARE INFORMATION!! Add to that, there were a couple of critical scenes that, because of their lack of communication, were seriously implausible due to the level of coincidence required for things to have worked out. For example, Tess just happens to pick the correct direction and arrives in the knick of time to save Abby? Seriously? The narrator did a good job distinguishing between characters, but nothing could save this from being more of a chore than an enjoyable listen. Read it but would not recommend it! I finished this book reluctantly. I found it too wordy, too detailed, with Abby full of stupid old cliches. I increased the reading speed to finish. The narrator was great! I don't like critiquing a book because I can't write one. I thank the author for all of the brilliant ideas. I would have preferred two different narrators. What aspect of Suehyla El Attar’s performance would you have changed? She tried her best but the performance didn't hit the mark for me. Had she had another person narrating with her I think it would have improved the listening experience. Did Dangerous Games inspire you to do anything? I am glad I gave this book a chance. I had been on a streak of listening to excellent books of this nature which could be why I was a little disappointed by this one. Just the same I am glad I listened to it and would reccommend it.